The retro-futuristic Russian rogue Nikolai Dante began in 2000AD Prog 1035, dated 25 March 1997, and came to its conclusion 15 years later in Prog 1791. Created by the Scottish team of writer Robbie Morrison and artist Simon Fraser, who would eventually alternate on art duties with industry veteran John M Burns, the popularity of the series shows in the 10 different graphic novel compilations of Nikolai Dante stories that Rebellion have published over the years. The 11th and last Dante book is Sympathy For The Devil, available now. 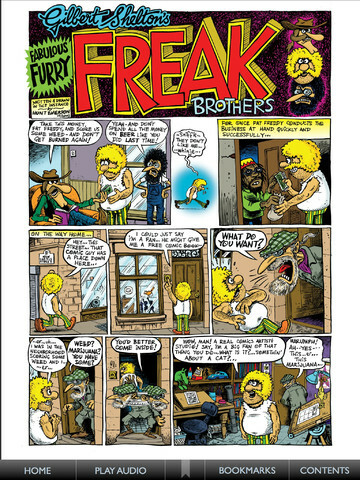 Jeremy Briggs talked to Simon Fraser for downthetubes about his work on the character. 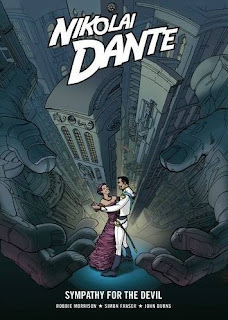 DTT: How did you first hear about Nikolai Dante? Simon Fraser: Robbie mentioned it to me while I was working on drawing Shimura ‘Dragonfire’, which he wrote for the Judge Dredd Megazine. He had been doing a lot of research in the Mitchell Library (in Glasgow) on Peter the Great for a historical project he had wanted to write involving two Scottish mercenaries. That was transformed in a more fantastical direction when he knew that 2000AD were looking for new ideas. Robbie is always very enthusiastic about his ideas and enjoys talking about them when he gets a few drinks in him. DTT: How much input did Robbie Morrison give have on the look of the series and how collaborative has the work with him been over the years? Simon: Robbie’s only specific visual instructions were that it should look Napoleonic and that there should be Onion Domes. There’s actually a lot you can get from those two ideas. Robbie is very good at getting to the essence of something, then he has the confidence to let an artist run with what they come up with. DTT: It is unusual these days for a British adventure series to run for such an extended period of time with the same creative team. Did it pose any particular problems for you such as aging the characters, maintaining visual continuity with John M Burns, or maybe even getting tired of drawing the same characters? Simon: Absolutely! My life has changed enormously during those 15 years and it has sometimes been very difficult to keep focussed on an idea that we started working on in our mid 20s. It was essential for Dante to age (if not mature exactly ) because we were ageing ourselves. So to keep the character vital for us he had to reflect ourselves in at least that way. We did actually take a few breaks here and there. John Burns did most of the heavy lifting during the first war. That was great as I found that I had no particular appetite to draw a war story. I’m much more comfortable with the swashbuckling and the character pieces and the comedy. Burns really gave the sieges and the massacres an epic sense of tragedy and scale. It’s surprising how little interaction there was between the artists. Periodically I sent John a sketch, Dante’s crewcut for example, but most of the time I deferred to him and he to me. There were certain characters that were his designs, Dante’s Mum, Kurakin and the Rhudinstein Irregulars, who I had to really work at to get my own recognisable versions of. There are some points on which we disagreed. He drew Kurakin rather soft and pretty, which I felt didn’t match who the character was. A Mongol swordswoman can be beautiful, but there has to be real steel in her bearing , not just in her hands. Kurakin would never be passive or merely decorative. Dante’s mum was a perfect design however, I couldn’t improve on his version. 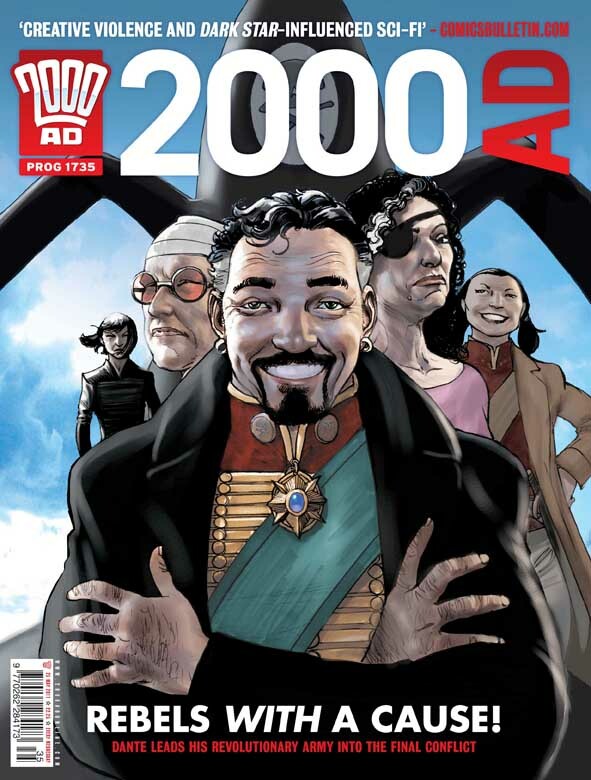 DTT: Robbie included his versions of various British comics characters into the stories, from Bryan Talbot's Luther Arkwright as Captain Luther Emmanuel to Warlord's Lord Peter Flint as Lord Peter Flintlock. Did you enjoy these 'in-joke' sections of the stories and how much reference material did you need for these characters? Simon: Those references were all good fun. I like that we could tip our hats to the stories that inspired us. Luther Arkwright particularly is a work which both of us have a huge amount of respect for. A certain irreverent cheek is one of those 2000AD traditions that makes the comic what it is. I don’t remember doing any particular reference for the characters in question. It’s not important to get bogged down on what are essentially throw-away gags. DTT: Now that the series is over and you can "choose your favourite child" as it were, was there a particular Dante character that you particularly enjoyed drawing? Simon: I became very fond of Dante’s Mum, Katarina Dante. She became a key figure in the story and her strength as a character probably pushed her further forward in the narrative than we might have expected at the beginning. Mad King Henry and Papa Yeltsin were always a hoot to draw. While I love Lulu as a character she was by far the most problematic to draw. This was entirely my own fault (all that lace! ), but once you have a strong look for a character you kind of have to honour it. No matter how much of a pain in the arse it is to render. DTT: What are you working on at the moment and what can we expect to see from you in the future? Simon: That’s hard to say for certain right now as I’m just at contract stages with a couple of big projects. It looks like I’m working on a Doctor Who story for IDW, which is a thrill for me as I grew up immersed in Wagner/Grant/Mills and Moore’s Doctor Who Weekly work. Dave Gibbons, Steve Dillon and David Lloyd had a huge influence on me through that comic. I’m in negotiations right now over a short sci-fi piece for Dark Horse with a writer who I’ve wanted to work with for some time. I’m also working on a pitch for a series of books of comics journalism trying to explain the ongoing events of the Arab Spring. That’s going to be a big project and something I feel very strongly about. I’m still working on more Lilly Mackenzie in my spare time too. 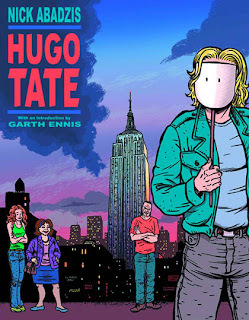 Continuing Panel Borders' month of shows about the depiction of travel in comic books, Alex Fitch talks to the award winning cartoonist Nick Abadzis about the recent Blank Slate Books collection of his much loved strip Hugo Tate, originally serialised in Deadline magazine. Alex and Nick discuss the autobiographic aspects of the serial, his experiences in the brief but influential wave of 'adult' British comics in the late 1980s and how the story reflects the difficulties of any Brit coming to terms with life in America. (via Jeremy Briggs): Britain's Tank Museum in Bovington is using the seminal anti-war comic Charley's War to promote activities at the centre this coming half term. The Museum has planned a week of art themed family activities for the October Half Term with the theme 'War Paint' from 27th October 2012 to 4th November 2012. 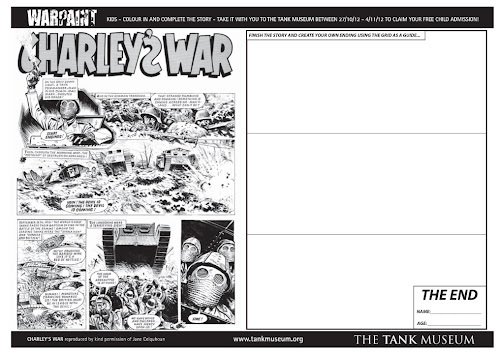 These include live tank action and tracked vehicle rides - and children who complete their artistic challenge (PDF link) and draw their own comic strip go free (more details below). Activities announced include military themed creative activities for kids, the opportunity to learn about different types of camouflage, a special exhibition of soldier’s art, free trails, talks and tours. There will also be the chance to build and paint a wooden model tank and take it home with you (extra charge applies) and see Tank Action Displays (weekdays only, 1.00pm). The Museum will also be hosting a Big Draw event, one of many events across the UK that will be part of a major national initiative to engage families in art. local artist Heidi Dickenson will be leading a special workshop at The Tank Museum on Wednesday 31st October. Visiting families will be encouraged to contribute to a giant artwork, adding camouflage schemes, textures, details or messages within a large tank-shaped outline. They will be able to add to the `tank` directly, or create their own section on a piece of paper for sticking on to it. *Terms & Conditions: To qualify for a free child admission, your child must download and complete the above challenge as described. Present the completed print out on admission. The completed cartoon strip must be original artwork (photocopies will not be accepted). A maximum of ONE free child admission will be permitted per full paying adult. A child is defined as being aged 0 - 16 years. Cannot be used in conjunction with any other offer. While I was away last week in the wilds of Scotland, OFF LIFE - the new, free indie comic magazine, available in print and online - got under way with a sparkling first issue crammed with some great comics. My apologies to the editorial team for not being about to give it a plug, because it's fantastic. 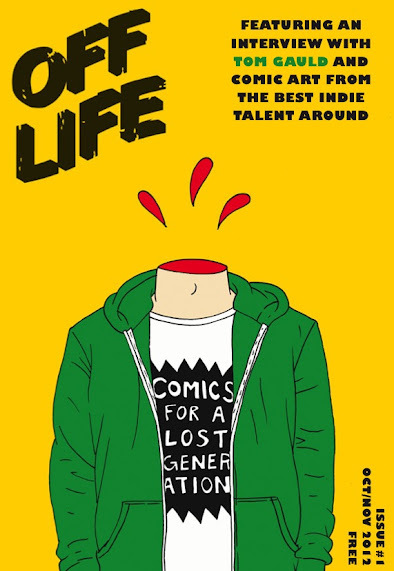 OFF LIFE is the UK's only street press comic magazine. Each issue featurs comic stories from today’s best indie talent, compiling them in a bi-monthly magazine and then leaving them around bars, coffee houses, shops and galleries for good people like you to pick up – free of charge. The first issue has some fab strips - one pagers and longer strips - from talents such as Sean Azzopardi, Neill Cameron, Rob Davis and Lizz Lunney, just to name a few, along with a profile of ace creator Tom Gauld. It's a strong start for the title that aims to put great talent in front of more people - not just comic fans - and I hope it's the success it deserves to be. Movie, anime and games title MyM Magazine has been acquired by MCM Expo Group, organisers of the MCM London Comic Con as well as other events across the UK. MyM Magazine is currently available in WH Smith and all good newsagents in the UK, Barnes & Noble in the USA and is distributed by COMAG. 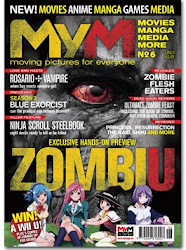 Since its launch earlier this year, MyM Magazine has set out to be a breath of fresh air for anime aficionados, film fans and gamers alike, and we can reassure readers that our approach of no-nonsense reviews, in-depth features and stylish design will continue under MCM Expo Group ownership. 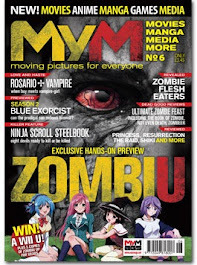 As MyM Magazine already covers everything from videogames to anime, movies to cosplay, the editorial team believe that partnership with the hosts of an equally wide-ranging event such as MCM London Comic Con is a natural fit - and one they say will provide an exciting opportunity to further expand and improve our coverage of popular culture in future issues. 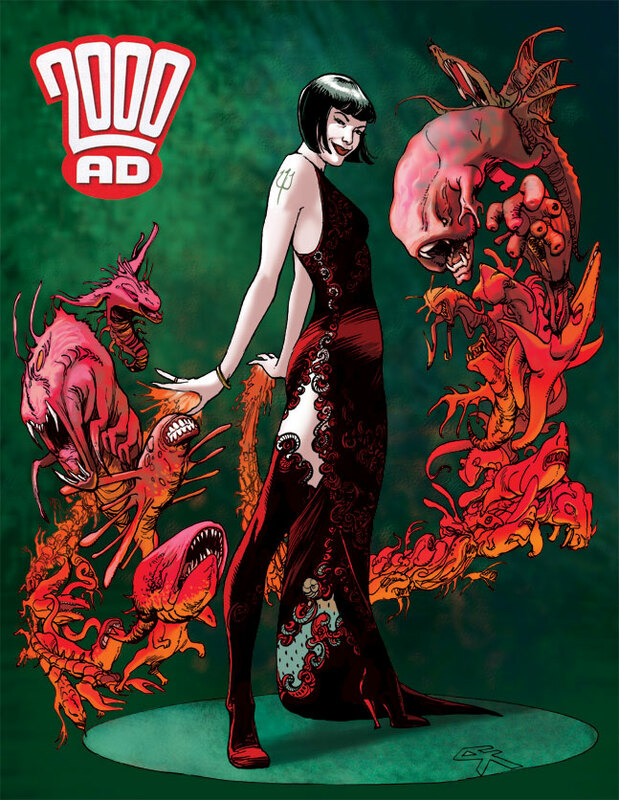 "MCM London Comic Con has always embraced all aspects of popular culture, so when a new magazine launched with the same ethos it immediately caught our eye," commented MCM Group co-owner Paul Miley. "We are very pleased to add the publication to our portfolio and believe that we can help MyM Magazine grow into an even more successful title." Immediate Media is to launch Horrible Histories magazine on 18th October 2012, a humorous and fact-filled title aimed at curious 7 to 10 year olds. With art from Martin Brown for initial issues, the new monthly magazine is based on the bestselling books by Terry Deary, and joins the successful Horrible Histories brand that includes the award-winning BBC television series and national stage show. As the only comedy magazine based on fact for the primary market, Immediate tell us Horrible Histories is designed to engage children by concentrating on the wicked, weird and woeful things that have happened in history, with an underlying factual accuracy that will appeal to parents. The title is being produced by Immediate Media's award-winning youth and children's editorial team under licence from Scholastic Children's Books. Combining the style and humour of the books, the monthly title will offer young readers a fun mix of jokes, cartoons, posters, competitions and games. 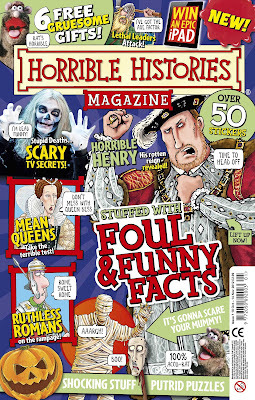 Each issue will carry a high-quality, exclusive Horrible Histories covermount and around 50 fun Horrible Histories stickers. In keeping with the brand's vile vision of history, Issue 1 comes with a free 'disgusting peasant pack' containing a fake nose, warts, boils and rotten teeth! Horrible Histories magazine will be out every four weeks, priced at £2.99 and will be available at all major retailers and independents around the UK. According to comics historian Paul Gravett's 1001 Comics You Must Read Before You Die Hunt Emerson is "Britain's greatest underground cartoonist". 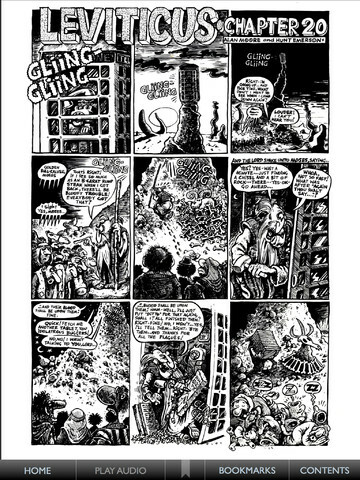 According to the The Comics Journal his mind "works on a level untouched by most humans". 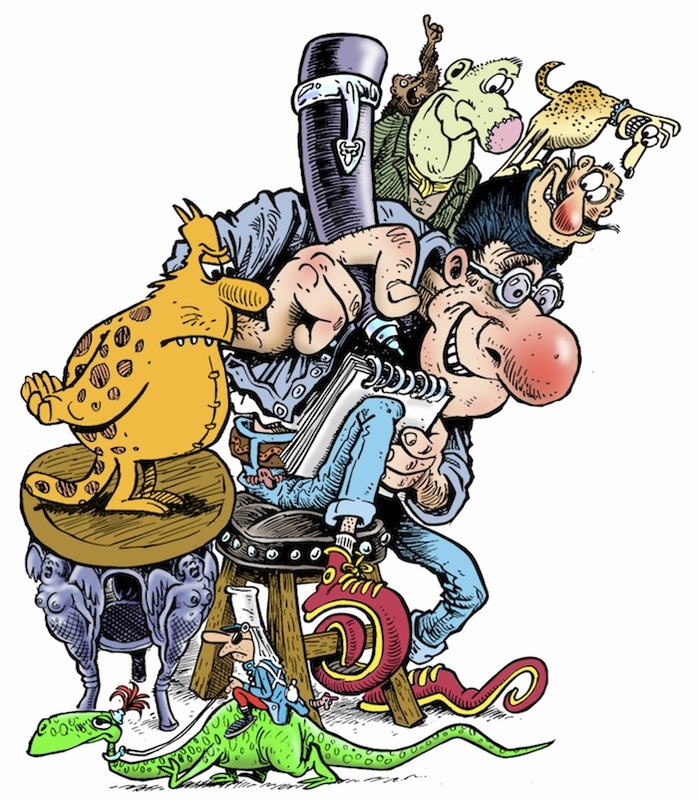 According to the French he is, with Robert Crumb and Gilbert Shelton, one of the legends of underground comics. According to his mum, he's still a lovely boy. 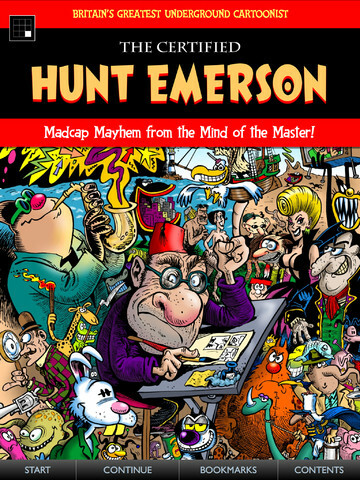 Now in celebration of over 35 years of cartooning madness, digital publisher Panel Nine has released The Certified Hunt Emerson - a smashing collection of his incredible work (can you tell I'm a fan of his work, yet?). The collection - available now for iPad - features over 200 pages of the finest cartoons and comics from Emerson's warped mind. The release comes just as Knockabout and Top Shelf release Hunt's adaptation of Dante's Inferno in print, a fabulous new work by Hunt with Kevin Jackson, which is another gem of a title from the man who also created comic strip versions of The Rime of the Ancient Mariner and Lady Chatterley's Lover. Amongst the 27 different strips included in The Certified Hunt Emerson are his collaboration with Alan Moore on Leviticus, his take on Gilbert Shelton's Freak Brothers, the adventures of cats Firkin and Calculus, Puss Puss, Alan the Rabbit and much, much more. The one thing missing for me is his album cover for Scandal in Bohemia for Jazz Butcher, (the only album I ever bought for the cover first rather than the music but was glad I did) but hey, with digital editions there's always an update! The comprehensive set of extras includes audio commentaries and introductions to the strips by Hunt, a stunning cover gallery spanning over three decades, a gallery of self-portraits, a special section of astounding illustrations that have rarely or never been seen, and an exclusive interview with the artist for this collection that includes embarrassing photos of Hunt and comics creators such as Bryan Talbot and Robert Crumb. Priced at only $9.99 / £6.99, the collection is, the publisher believes, a mind-warpingly attractive bargain. Further Notice: Hunt Emerson is quite simply brilliant. We'd have published this anyway!